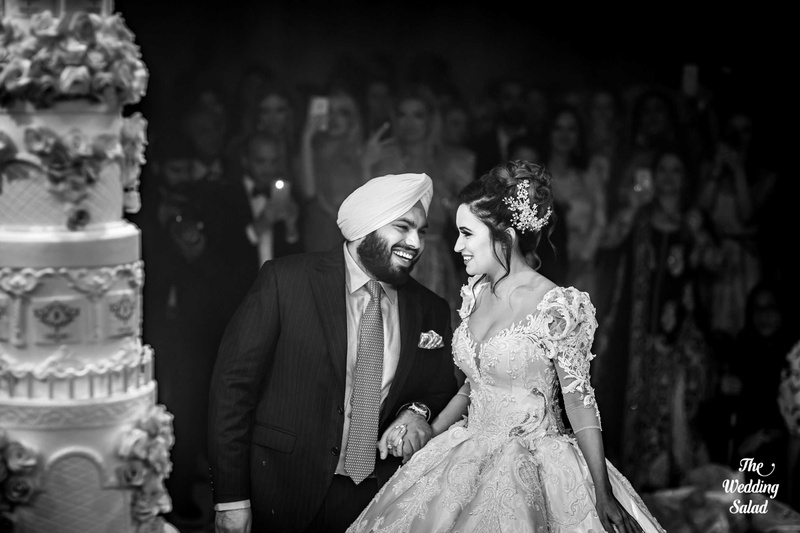 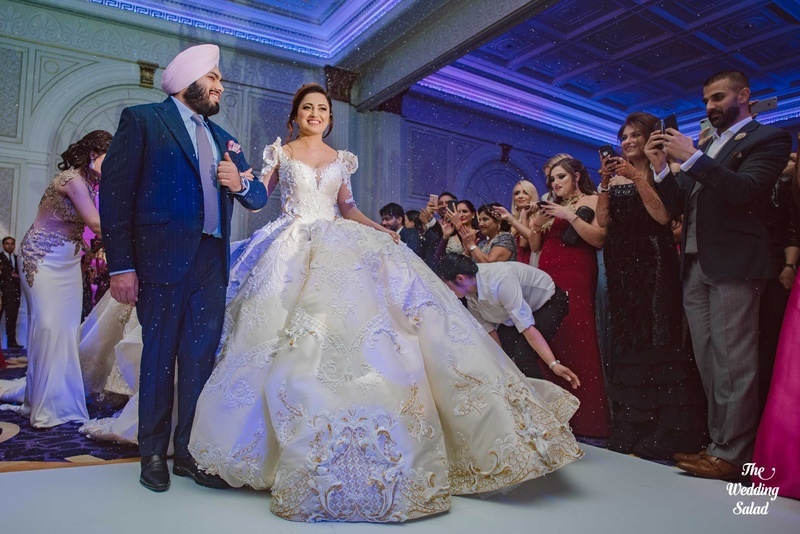 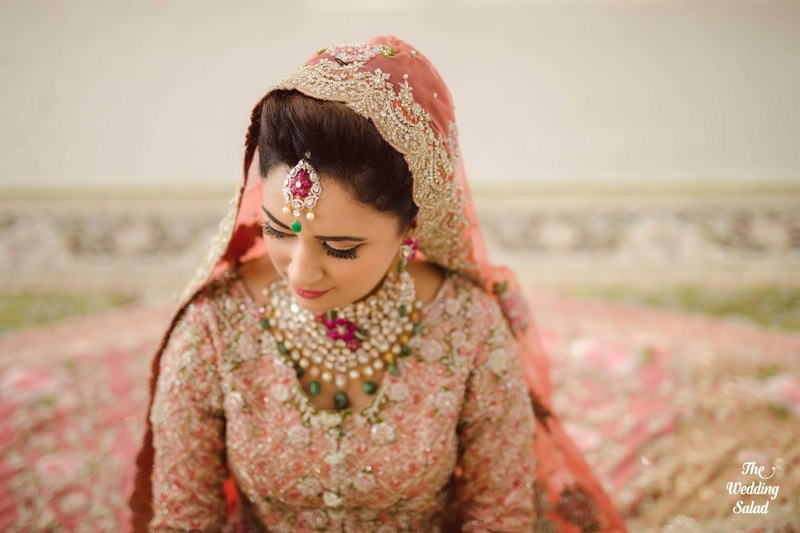 This bride wore a customised Manish Malhotra gown in her Palazzo Versace Dubai wedding! 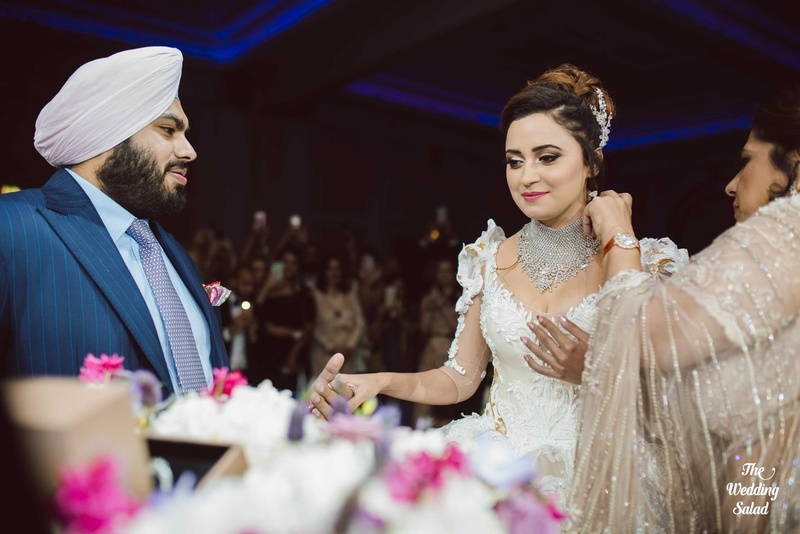 Japinder and Harpreet just had the most elegant and royal wedding ever at Palazzo Versace, Dubai! 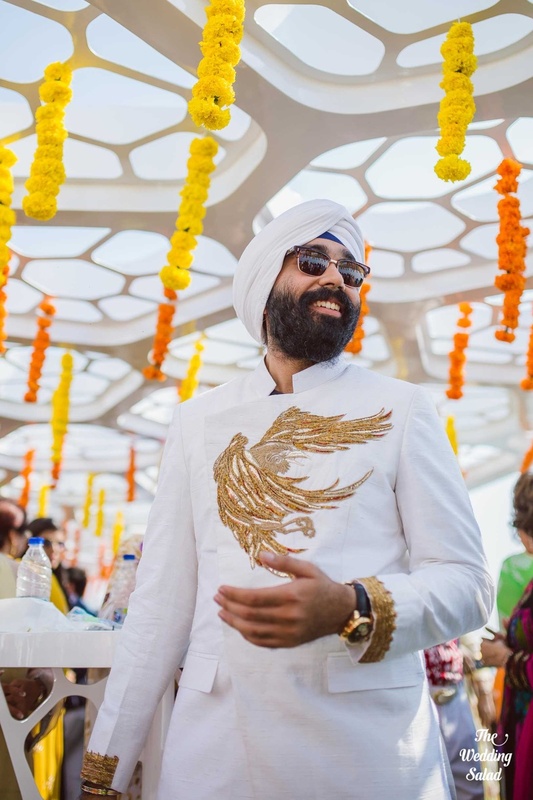 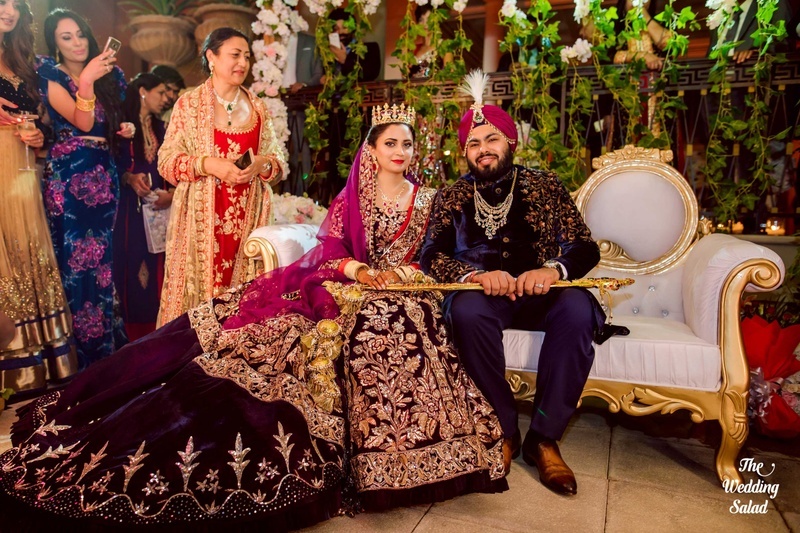 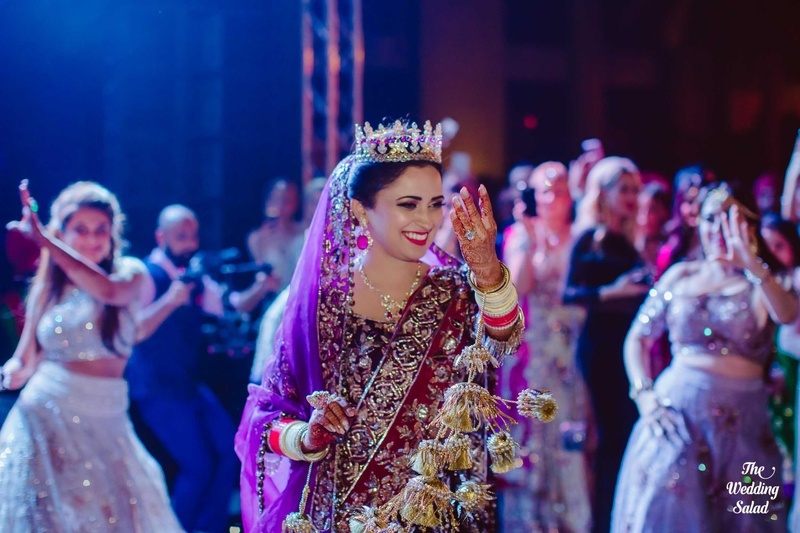 The luxury venue played host to the couple's grand wedding, as they celebrated their international destination wedding with pomp and flare. 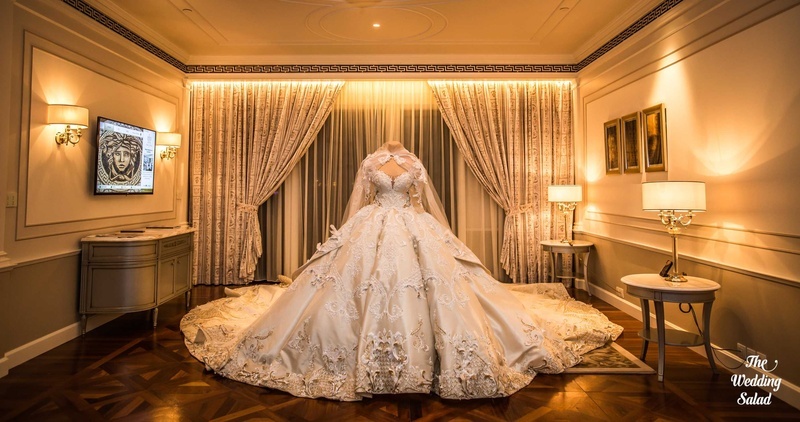 What happens when a princess meets her prince charming? 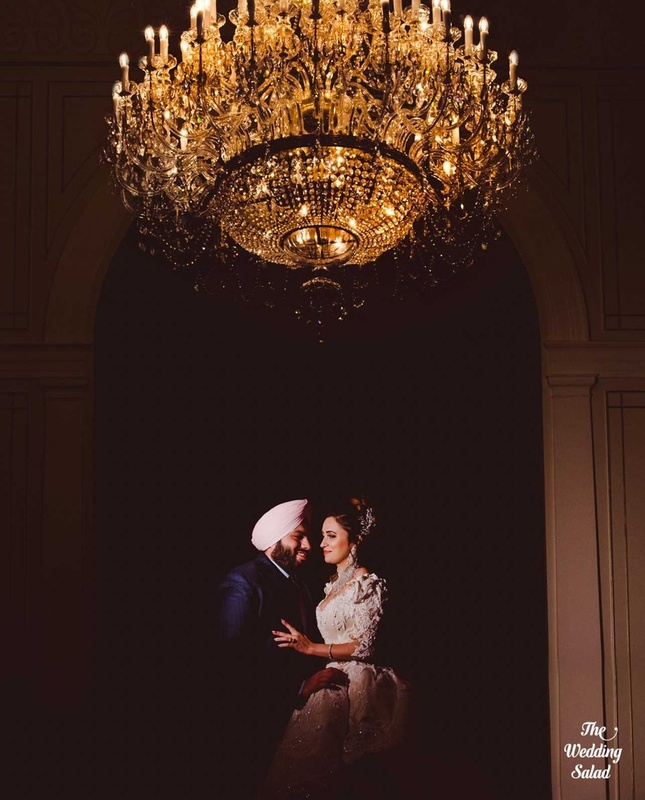 Violins play in the background, the moon suddenly seems bigger and prettier and nothings seems to go wrong! 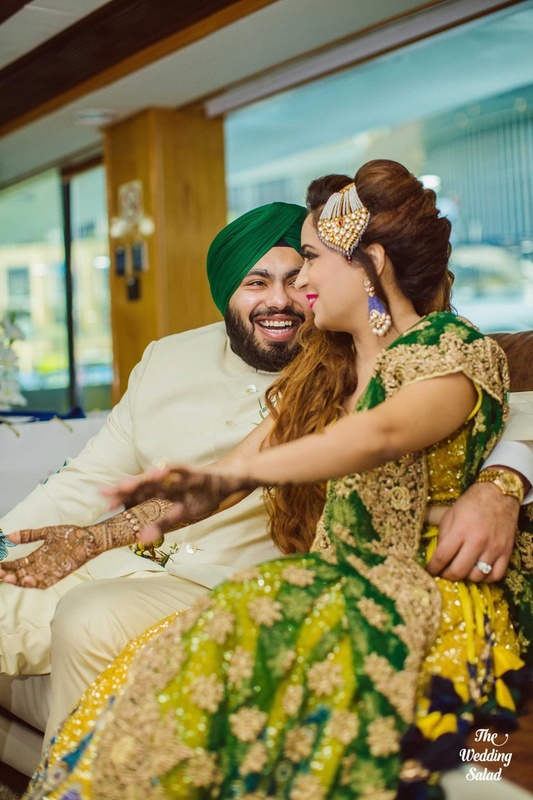 This is exactly what happened when Japinder met Harpreet almost a year ago. 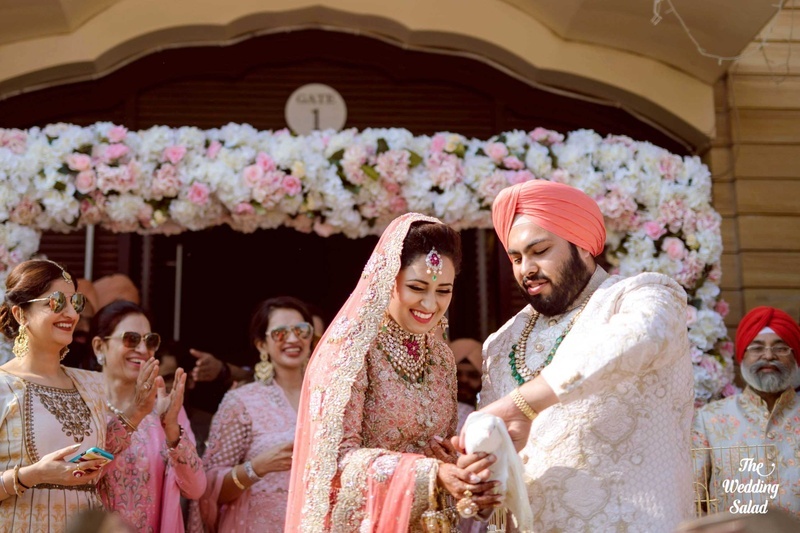 He proposed to her in Delhi’s most serene and holy place- Gurudwara Bangla Sahib and she instantly said yes! 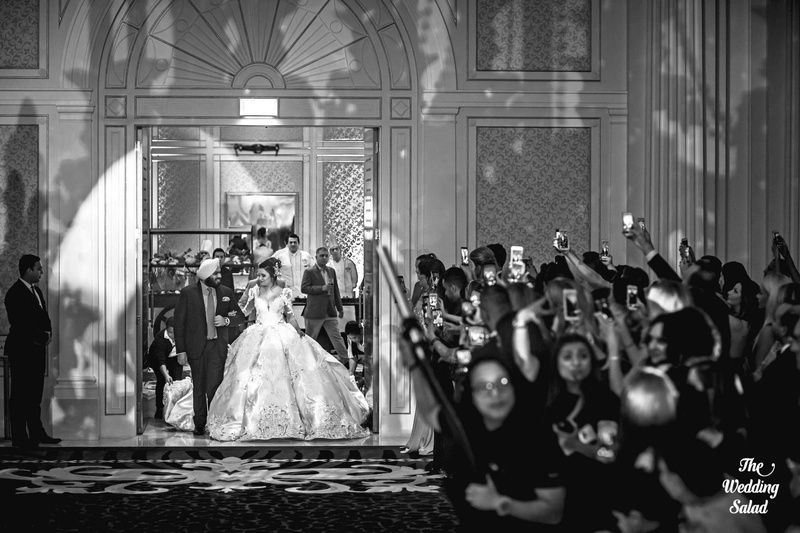 The two of them had a purely majestic and royal wedding at Palazzo Versace Hotel, Dubai. 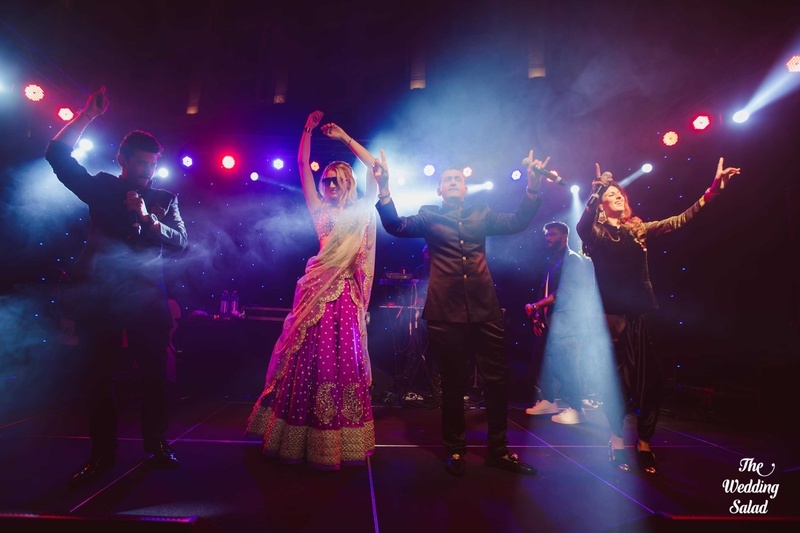 Scroll down to see the sparkly and star studded affair captured by The Wedding Salad. 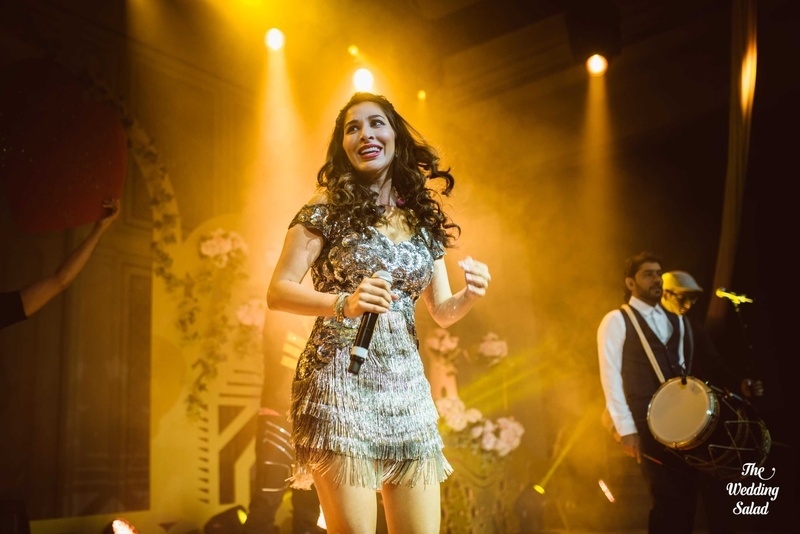 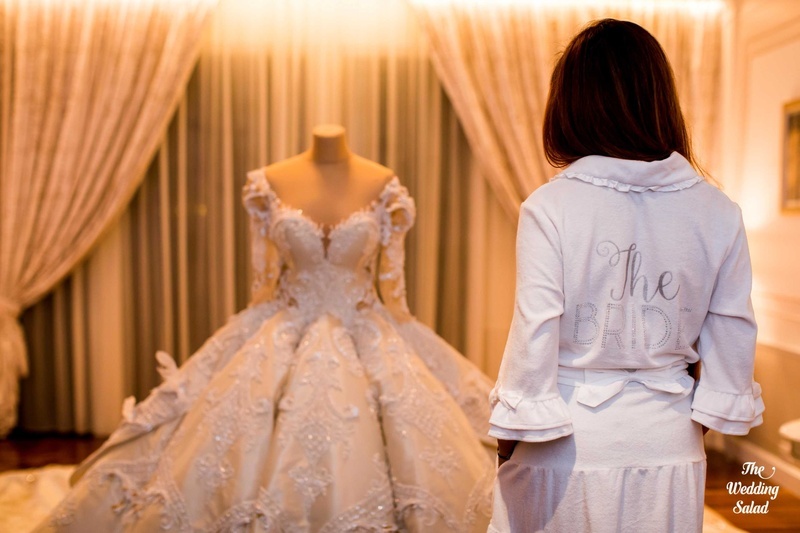 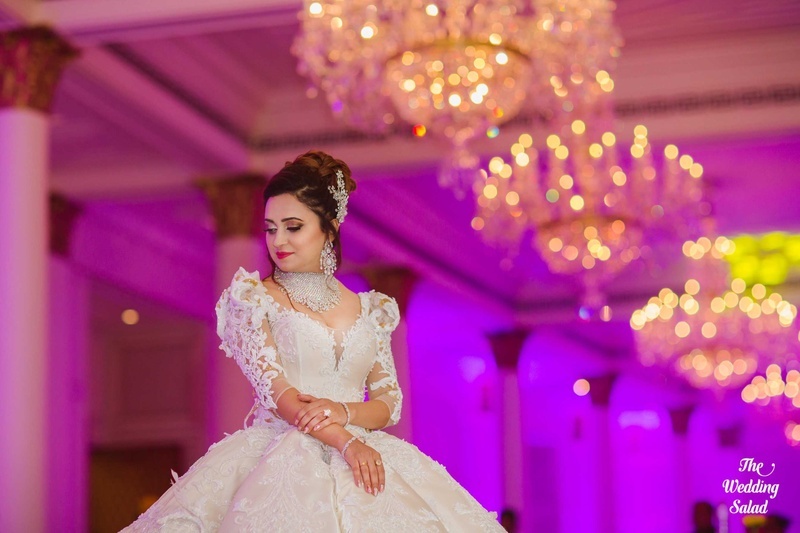 Japinder wore one of a kind white gown on her engagement designed by Dar Sara High Fashion. 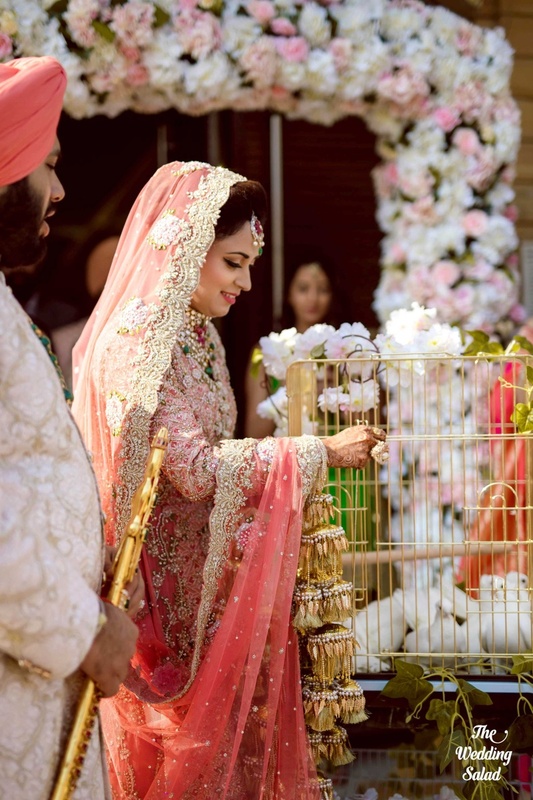 They also had the most dreamy mehendi ceremony ever. 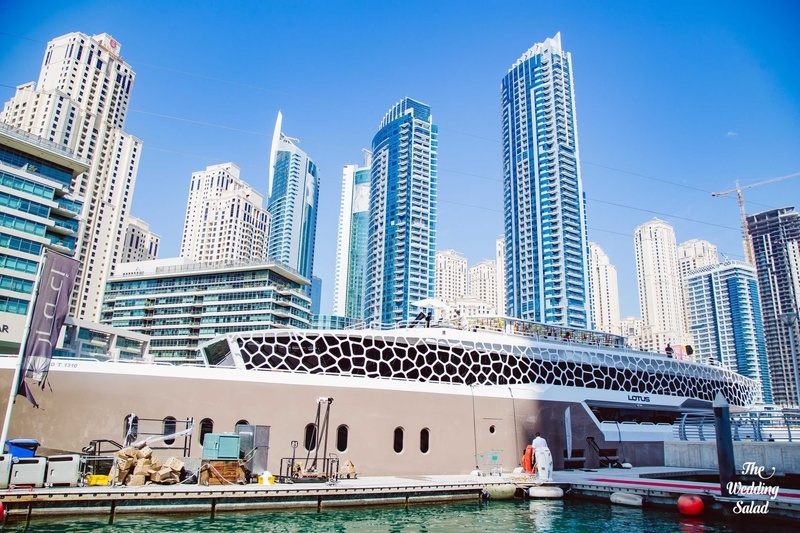 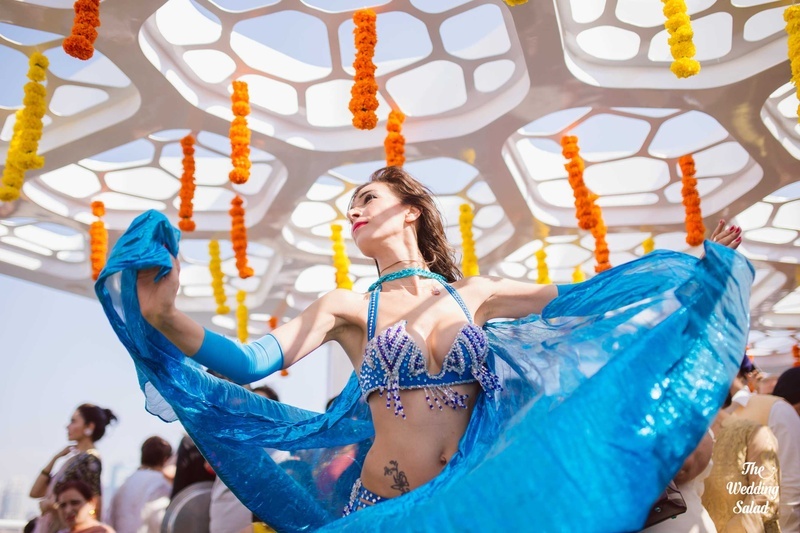 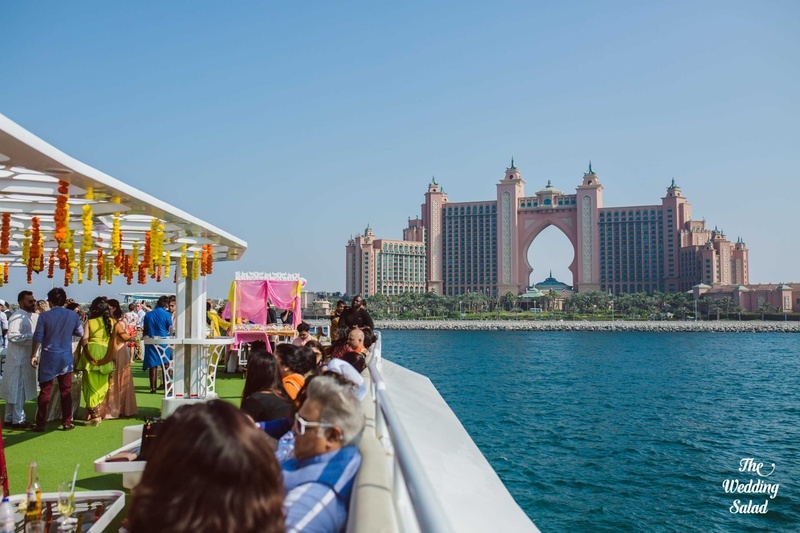 It was held on a cruise overlooking the Dubai line. 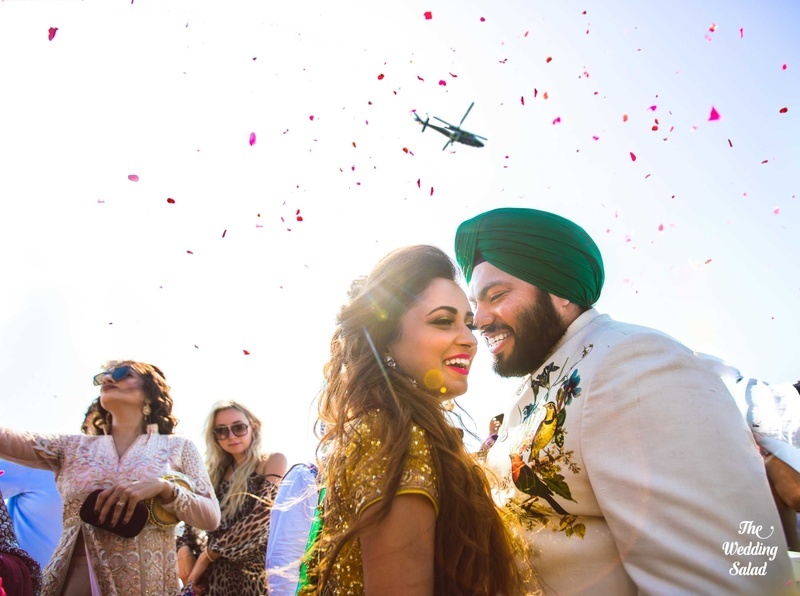 A helicopter showered 400kgs of rose petals on the guests. 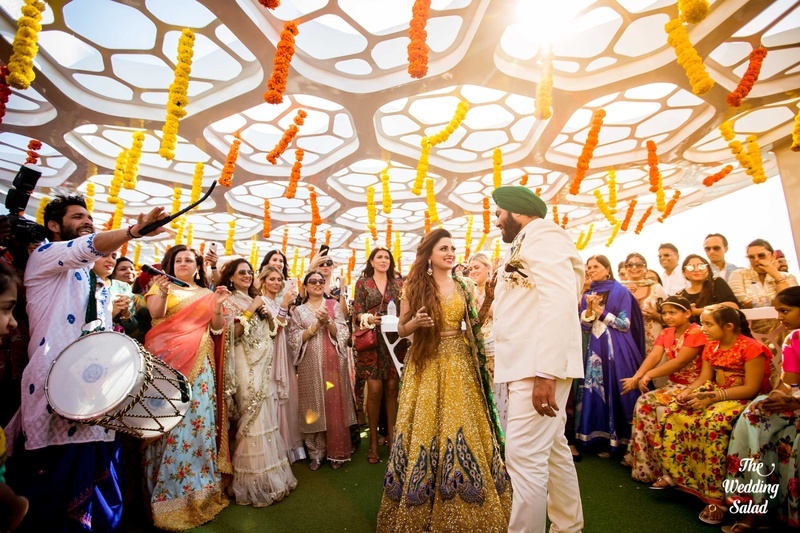 Harpreet wore Rohit Bahl while Japinder wore a green and yellow lehenga by Shaveta and Anuj. 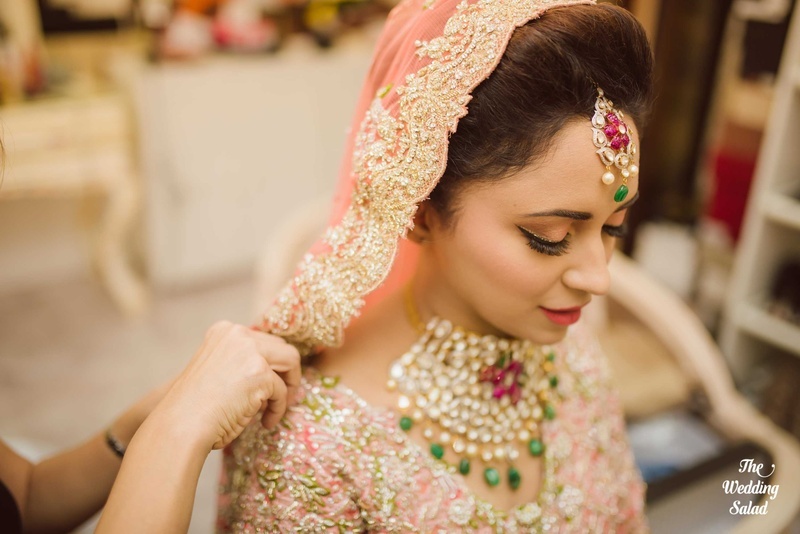 Her lehenga was adorned with 3-D peacocks and millions of sequins. 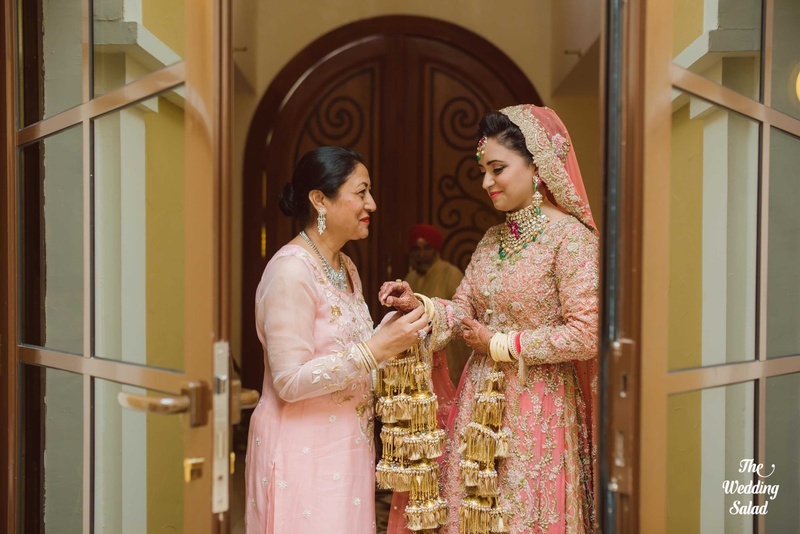 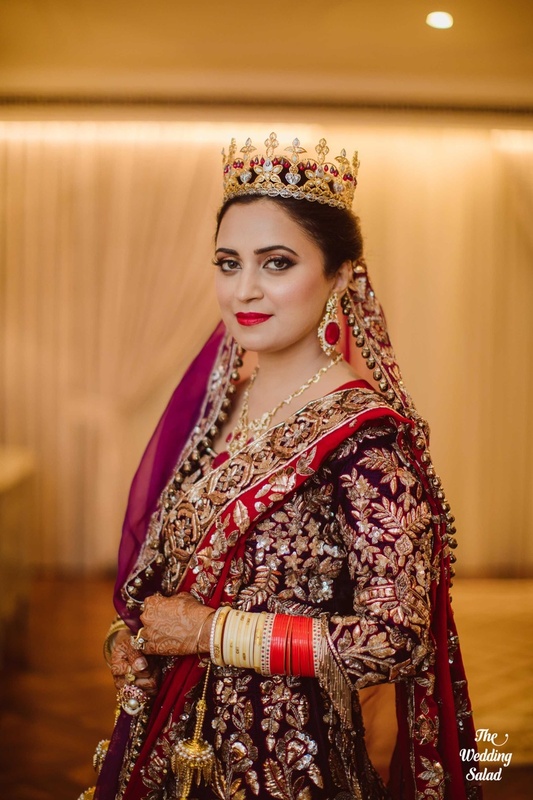 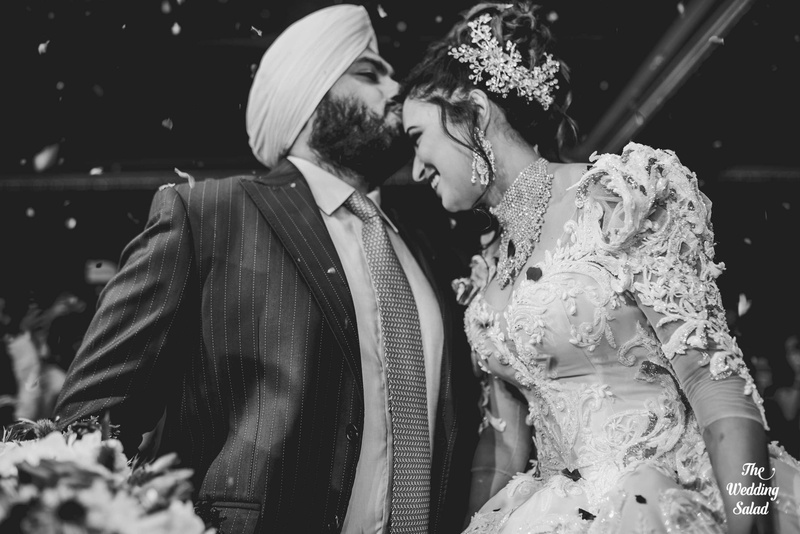 It was a 20kg lehenga that the bride pulled off with utter ease! 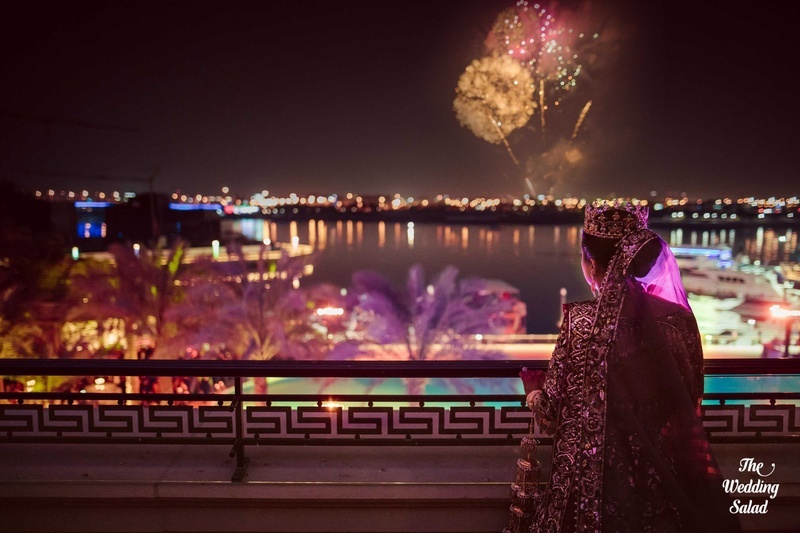 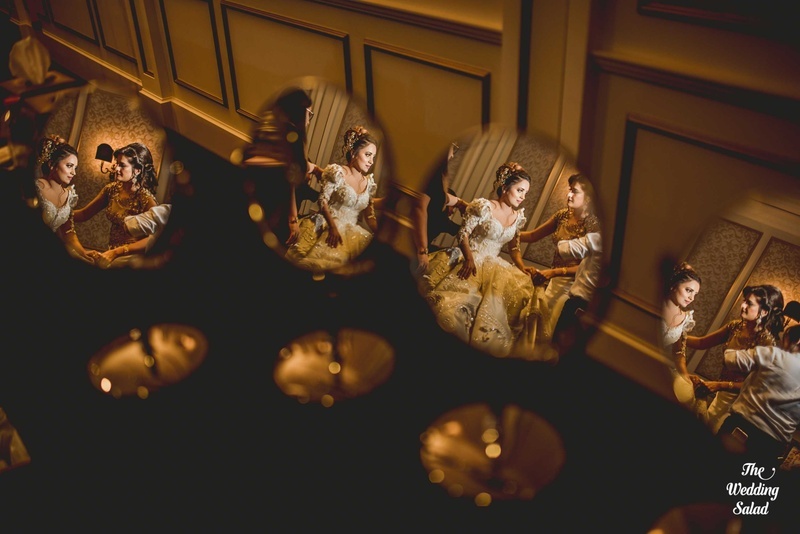 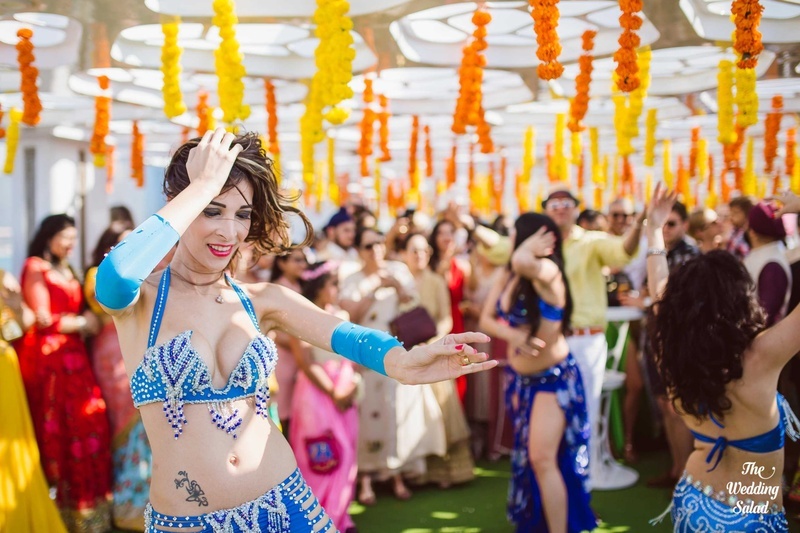 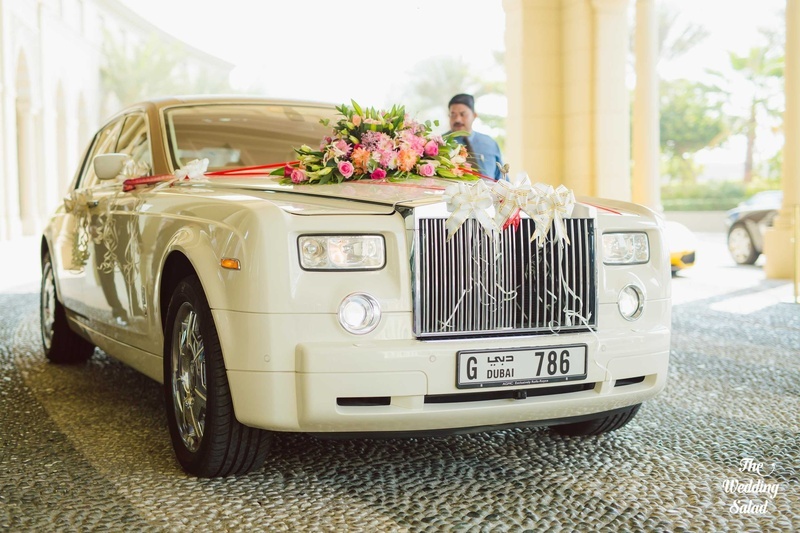 Check out the Palazzo Versace, Dubai wedding below!